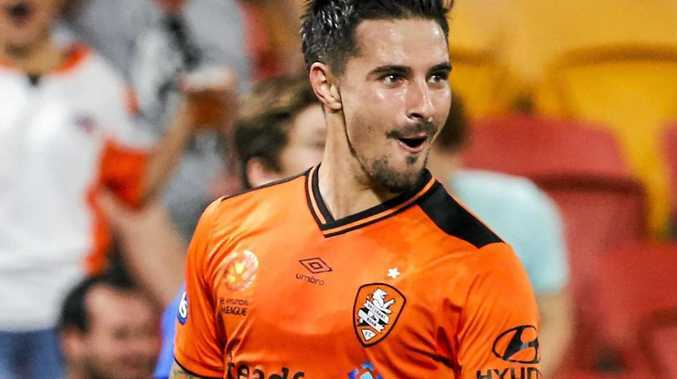 FOOTBALL: Brisbane Roar and its star striker Jamie Maclaren may be on the verge of parting ways, a contract dispute threatening to tear them apart. Out of contract at the end of the season, the 23-year-old's management has knocked back the new deal put to him by the Roar. Fuelling the fire is the club's interest in attracting veteran Irish striker Robbie Keane, 36. The former Tottenham, Liverpool, Inter Milan and Celtic forward recently announced he is leaving the LA Galaxy after six years in the United States. "It's a disgusting offer ... and it's highly disrespectful,” Maclaren's agent, Paddy Dominguez, told News Ltd.
"He'd be the lowest paid of any of the top strikers in the A-League. The Roar could yet move to offload Maclaren for a price in January to ensure he doesn't leave the club for nothing. But Roar managing director Mark Kingsman responded by saying he hoped negotiations to keep Maclaren at the club would continue. "In any negotiations, normally the club makes an offer, the agent wants a higher amount and you meet somewhere in the middle,” Kingsman told Fairfax. Kingsman confirmed he would make an inquiry about Keane, a one-time teammate of Aloisi's at Coventry City. "What A-League club wouldn't be interested in Robbie Keane? I've got a number for him, but I'd say it's going to be out of our range,” he said. In the meantime, Maclaren will be front and centre for the Roar when they take on Western Sydney tonight at Spotless Stadium. The Roar star, who has netted just two goals in six A-League games this season, has dominated the Wanderers in the past, kicking seven goals in just four games against them in 2015-16.